Our range of products include rabeprazole 20 mg domperidone 10 mg tablets, cefuroxime axetil tablets, zinc sulphate 20 mg tablets, ibandronic acid 150 mg tablets and pramipexole tablets. 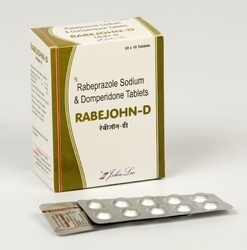 Rabeprazole is used to treat certain stomach and esophagus problems (such as acid reflux, ulcers). It works by decreasing the amount of acid your stomach makes. It relieves symptoms such as heartburn, difficulty swallowing, and persistent cough. This medication helps heal acid damage to the stomach and esophagus, helps prevent ulcers, and may help prevent cancer of the esophagus. Rabeprazole belongs to a class of drugs known as proton pump inhibitors. Rabeprazole+Domperidone Tablet may also cause side-effects not listed here. CEFUROXIME AXETIL 250 Mg, 500 Mg.
Cefuroxime is a cephalosporin antibiotic. It is available as a generic drug and is prescribed to treat infections with susceptible bacteria including skin and middle ear infections, tonsillitis, throat infections, laryngitis, bronchitis, pneumonia, urinary tract infections, and gonorrhea. Cefuroxime is used to treat certain infections caused by bacteria, such as bronchitis; gonorrhea; lyme disease; and infections of the ears, throat, sinuses, urinary tract, and skin. Cefuroxime is in a class of medications called cephalosporin antibiotics. It works by stopping the growth of bacteria. Nausea, vomiting, diarrhea, strange taste in the mouth, or stomach pain may occur. Diaper rash may occur in young children. Dizziness and drowsiness may occur less frequently, especially with higher doses. Zinc is a naturally occurring mineral. Zinc is important for growth and for the development and health of body tissues. Zinc sulfate is used to treat and to prevent zinc deficiency. Zinc sulfate may also be used for purposes not listed in thismedication guide. Ibandronic Acid is used to prevent and treat certain types of bone loss (osteoporosis). Osteoporosis causes bones to become thinner and break more easily. Your chance of developing osteoporosis increases after menopause, as you age, or if you take corticosteroid medications(such as prednisone) for long periods.This medication works by slowing bone loss to help maintain strong bones and reduce the risk of broken bones (fractures). Ibandronic Acid belongs to a class of medications called bisphosphonates. Stomach upset, diarrhea, pain in arms/legs, or mild flu-like symptoms (such as fatigue, muscle ache) may occur. If any of these effects persist or worsen, tell your doctor or pharmacist promptly. PRAMISTAR tablets are indicated for the treatment of Parkinson’s disease. PRAMISTAR tablets are indicated for the treatment of moderate-to-severe primary Restless Legs Syndrome (RLS). 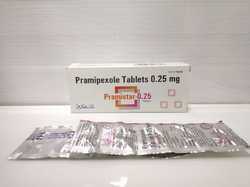 Pramipexole is used alone or with other medications to treat Parkinson’s disease. It can improve your ability to move and decrease shakiness (tremor), stiffness, slowed movement, and unsteadiness. It may also decrease the number of episodes of not being able to move (“on-off syndrome”). Nausea, dizziness, drowsiness, lightheadedness, trouble sleeping, constipation, headache, or dry mouth may occur. If these effects persist or worsen, tell your doctor or pharmacist promptly.